I had been reading all week that Rays and Hounds were about and popping up all along Chesil, so knowing that I was going to hit the beach for a few hours on Friday night meant I was buoyed with enthusiasm! I’m still at the stage of giddy anticipation when it comes to picking a location to go fishing along this shoreline, but I made the decision early on to try out Chesil Cove. Although this location supposedly fishes better in the summer and autumn, I was hoping to catch a few and if not, at least I was wetting a line. I had been checking in on Windguru all day, making sure that the wind was dying down, and for all intents and purposes it was fading and all was looking promising. I planned on arriving at the beach just in time or slightly after high tide. Well, as usual I left later than planned, and after a complete and utter ball drop on my part I added a solid 20 minutes+ to the journey as I thought I was being clever with a short cut. Note to self… Believe the satnav. I arrived at Chesil cove and parked up in a quiet pub car park. Getting out of the car I knew instantly that the wind wasn’t as low as it had been forecast. My guestimate was a steady 15/20mph going from left (Portland) to right (Towards ferrybridge) with the added sprinkle of drizzle. Still, the fish may still be biting. I grabbed my gear headed up and down the ramp and made my way down the beach. The pebbles were a lot larger on this end of the beach and the walk to where I actually wanted to fish took my about 5 minutes, if that – ideal! Looking up the beach I could see a few guys head lamps about 200 yards away, so obviously a few people thought there were fish about. Before I continue I just wanted to say a massive thank you to the guys at TackleUK for staying open a bit later on a Friday night so I could pick up my bait I’d ordered earlier in the day! Cheers guys’ top service! Sat in the dark waiting for the action! For bait I would be using Ragworm, Sandeel, Bluey and Cuttlefish. 1 rod would be in the gutter and the other as far as I could push a bait. I was also hoping that the Ragworm would attract the attention of some Doggies to at least keep the sport and bites ticking over. Normally I wouldn’t make a note of the first bait I used but I remembered this time as I hadn’t used it before. Cuttlefish. Cuttlefish stinks and is covered in black sticky ink, which is difficult to remove without fairy liquid, which you obviously don’t always have on the beach. Still if it produced the goods I won’t complain. 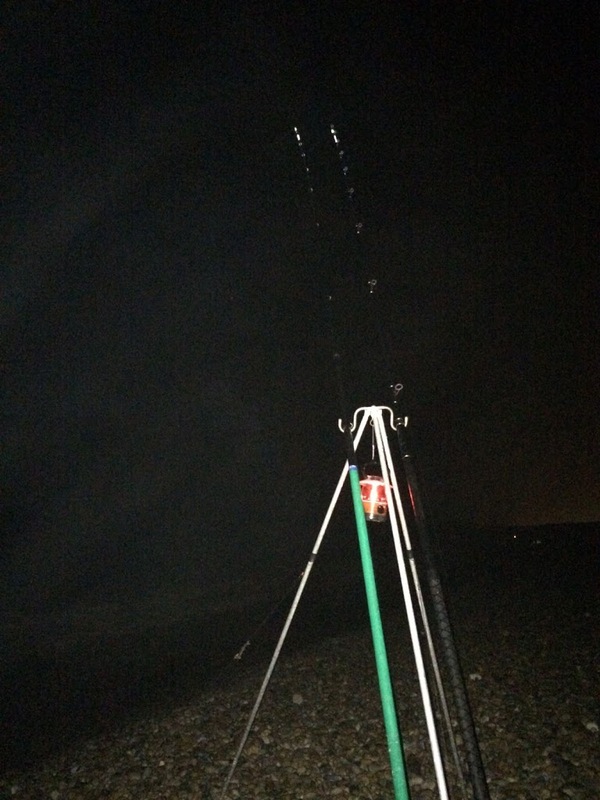 The swell seemed to be building, and although the tide was ebbing, the swell was definitely causing a slow and definite nod on the rod tip. On the other rod I had half a fillet of Bluey. The first bite took about 10 minutes, but on winding in it looked like nothing had even been nibbled! I swapped rigs over and cast back out. The bluey rod was getting the occasional knock but there was nothing on the cuttlefish rod, despite several re baits. Switching to sandeel meant a bite within 5 minutes. I was 2 and ½ hours past high tide now and well past what was considered the “Prime time” at the venue. By this time the anglers up the beach had packed up and gone home. The bluey rod registered a small knock, then nothing. I wound in the world’s smallest conger. It was so small it couldn’t even be considered a strap. It was a lace! Maybe even a ribbon… Still, saved from the blank, I was also finding quite a bit of weed along the knots after winding in too. The wind was beginning to swirl and although I was getting some small I knocks I was unable to connect with anything. Also on winding in a pennell with a bluey fillet on, I could clearly see pincer marks. Close encounters of the crabby kind! The gutter rod was almost dead, so I swapped both rods to worm baits and cast out. Bites were instant, but these were some of my last casts. The wind was increasing as was the rain and without a shelter this was beginning to get uncomfortable. I struck at one of the knocks and wound in a Pouting. 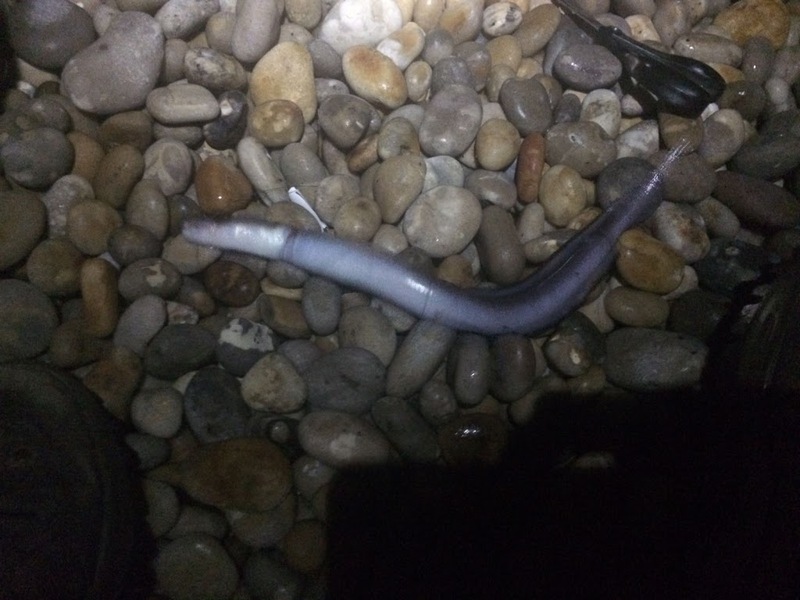 I did contemplate using it for live bait down in the gutter, but as it was already gone 1am and faced with a 45 minute drive I didn’t fancy slinging him back out and waiting for another hour or so. 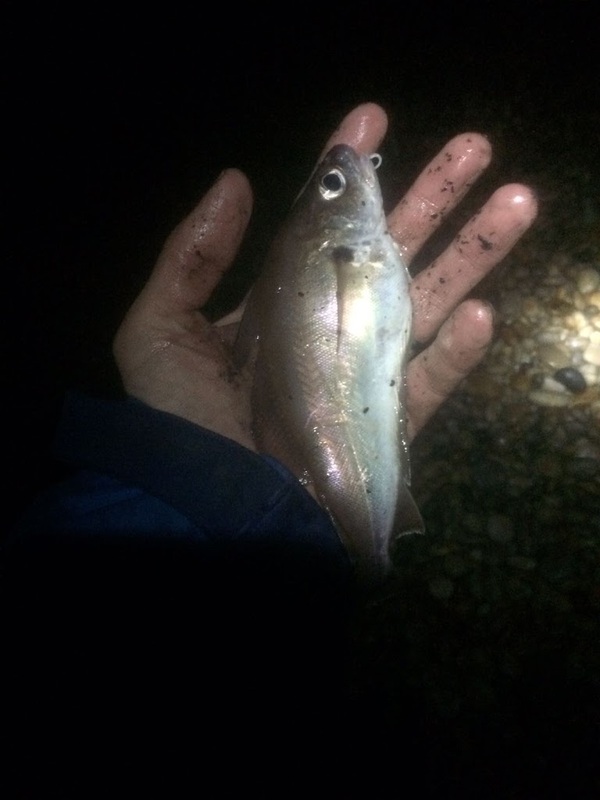 I missed a few more bites (which may have been crabs) and called it a night, finally getting in around 2.30am. Check the weather more thoroughly. The weather wasn’t great and although I avoided the blank, it was a hard night all round, with the wind and rain making it difficult to say the least. Practice casting. 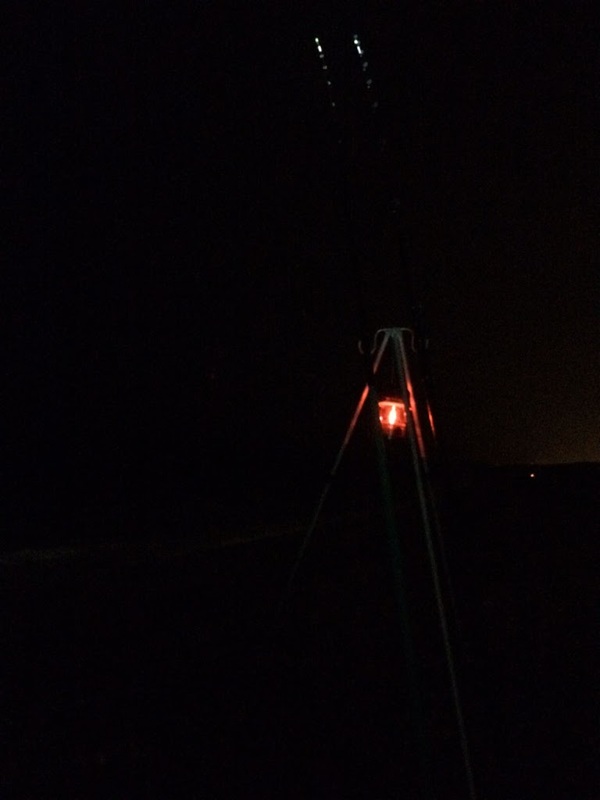 What I didn’t say above was the I was trying to practice Off The Ground casting (OTG), holding your rod still enough so your bait doesn’t disengage with the bait clip is hard going though. The slightest wrong movement and PING, off it pops! Try a different rig set up. I don’t think my rigs are doing me any favours. I was quite disappointed that I didn’t manage a Ray or Smooth hound. I suppose that’s why it’s called fishing and not catching though. Listen to advice. I had asked about fishing the Cove and although told it wasn’t a bad idea, I was given a few other options I should have taken up.